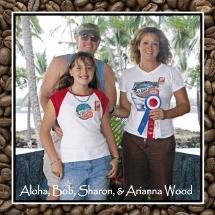 Arianna Farms 'Ono Kona Coffee is a family company with a simple mission: to provide the best quality coffee and coffee products for our customers. We take great pride in being a family owned company that strives to give our customers the best service and the highest quality. We appreciate each and every customer and if you ever happen to be in the islands send us an e-mail or give us a call and we'd love to give you a tour of our Farm.